University of Pittsburgh scientists—including McGowan Institute for Regenerative Medicine affiliated faculty members Valarian Kagan, PhD, DSc, Simon Watkins, PhD, John Kellum, MD, and Ivet Bahar, PhD—are unlocking the complexities of a recently discovered cell death process that plays a key role in health and disease, and new findings link their discovery to asthma, kidney injury, and brain trauma. The results are the early steps toward drug development that could transform emergency and critical care treatment. Damaged or malfunctioning cells can wreak havoc on the body, so it’s essential to destroy and recycle them safely and efficiently. One way this is accomplished is through ferroptosis, a highly regulated cell death program that uses iron (“ferro” means iron), and was first discovered in 2012, explained senior author Dr. Kagan, professor in the Pitt Graduate School of Public Health’s Department of Environmental and Occupational Health. The work also was led by Sally Wenzel, MD, director of the University of Pittsburgh Asthma Institute at UPMC, and Hülya Bayɪr, MD, research director of Pediatric Critical Care Medicine at Children’s Hospital of Pittsburgh of UPMC. To function harmoniously, the billions of cells in the body use a sophisticated and coordinated language to communicate. Last year, the team published two papers that uncovered the signaling language that cells use to initiate ferroptosis. The communication process they found requires a group of naturally occurring oxidized phospholipids called OOH-phosphatidylethanolamines (OOH-PEs). Phospholipids are the basic building blocks that make up cell membranes, which separate what’s inside a cell from everything else outside. However, if too many of these phospholipid signals are generated and too many cells die, the organs and tissues of the body cannot function normally. In the new work, the team used a variety of methods, including a new technique called lipodomics, to discover that the production of OOH-PE is a major crossroads at which a cell decides whether to initiate ferroptosis. Previous research had shown that OOH-PEs were made by a group of enzymes known as 15-lipoxygenases (15LOs). 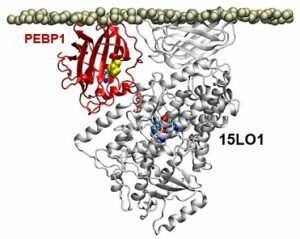 In the course of its study, the team discovered that a protein called PEBP1 was acting as a “warden” controlling whether the 15LO enzymes made either OOH-PEs or another type of membrane building block. When the cell made increasing amounts of OOH-PEs, it initiated ferroptosis. The researchers also used several cell culture experiments to demonstrate that PEBP1 and other key players in this pathway play a role in driving ferroptosis in several diseases, such as in kidney cells during renal failure, neurons in brain trauma, and airway cells in asthma. Preventing PEBP1 from binding to 15LOs might be a way to prevent ferroptosis, says Dr. Kagan. In traumatic brain and acute kidney injuries, there is typically an ever-widening area of cell death, indicating that ferroptosis is continuing unabated, even after cells involved in the initial injury have been cleared, said Dr. Bayɪr, also a professor in Pitt’s departments of Critical Care Medicine and Environmental and Occupational Health. This points to a longer therapeutic window of opportunity during which the ferroptotic pathway could be targeted with drugs to halt these devastating injuries. A future therapy targeting ferroptosis could work differently for asthma, noted Dr. Wenzel, the lead author. Dr. Watkins is Founder and Director of the Center for Biologic Imaging at the University of Pittsburgh, a member of the Pittsburgh Cancer Institute, and Professor and Vice Chairman within the Department of Cell Biology. Dr. Kellum is Professor in the Departments of Critical Care Medicine (primary), Medicine, Bioengineering, and Clinical and Translational Science at the University of Pittsburgh, and is also the Director of the Center for Critical Care Nephrology and the Vice-Chair for Research, both appointments in the Department of Critical Care Medicine, and Associate Director for Acute Illness in the Institute for Personalized Medicine at Pitt. Dr. Bahar is Distinguished Professor, the John K. Vries Chair, and the Founding Chair in the Department of Computational & Systems Biology at the University of Pittsburgh’s School of Medicine. Illustration: In a computer model, the protein PEBP1 on a cell membrane interacts with the enzyme 15LO1. 2017 Wenzel, et al. Cell.